Liberal billionaire George Soros is a major funder of a Latino activist group that produced an ad in Virginia depicting a supporter of Republican gubernatorial candidate Ed Gillespie running down minority children in a truck, which was pulled following the New York City terror attack that left eight people dead. 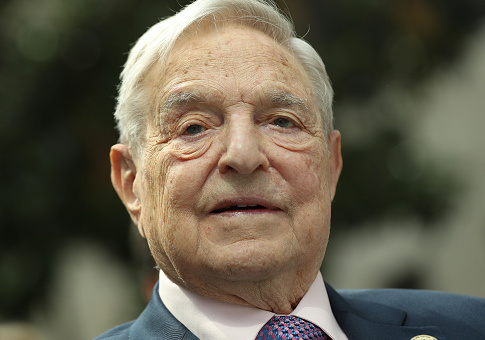 The group was part of Soros-backed efforts against Trump and Republicans during the 2016 election cycle, and its leadership includes individuals who previously worked directly with Soros at his foundation. The Latino Victory Fund, a group that carries a mission of "growing Latino political power by increasing Latino representation at every level of government," released the advertisement showing a man driving a pickup truck with a Gillespie campaign bumper sticker chasing minority children down streets and alleyways. "Is this what Donald Trump and Ed Gillespie mean by ‘the American dream?'" the voiceover says in the ad. Cristóbal J. Alex, the president of the Latino Victory, said the ad was produced to show how Gillespie has "eagerly embraced racism and xenophobia" during the campaign. The group pulled the ad following the terror attack in New York City on Tuesday and issued a non-apology when announcing the move. "We knew our ad would ruffle feathers," Alex said in a statement late Tuesday night. "We held a mirror up to the Republican Party, and they don't like what they see. We have decided to pull our ad at this time. Given recent events, we will be placing other powerful ads into rotation that highlight the reasons we need to elect progressive leaders in Virginia." Latino Victory was cofounded by actress Eva Longoria and San Antonio-based businessman Henry R. Muñoz III, who has chaired the DNC's finance committee since 2013. Longoria and Muñoz previously operated the Futuro Fund, which raised $32 million for Barack Obama's reelection efforts. Soros is the top individual donor to the Latino Victory Fund this year and has given $150,000 to the group, Federal Election Commission filings show. The Congressional Hispanic Caucus (CHC) BOLD PAC, the fundraising arm of the Congressional Hispanic Caucus, also gave $150,000 to the Latino Victory Fund. Soros produced funding for a campaign last year that involved the group. Numerous immigration activist groups, including Latino Victory, the Center for Community Change, and America's Voice, launched "Families Fight Back" during the 2016 election cycle. The Immigrant Voters Win PAC was created as part of the campaign with a goal of registering 400,000 new Hispanic voters before the November elections. Soros, who vowed to spend $15 million to court Hispanic voters, initially cut a $3 million check for the committee and for months was the sole donor to the PAC. "The intense anti-immigrant and anti-Muslim rhetoric that has been fueled by the Republican primary is deeply offensive," Soros told the Hill at the time. "It is harmful to our democracy and our national interests. There should be consequences for the outrageous statements and proposals that we’ve regularly heard." Deepak Bhargava, the executive director of the Center for Community Change, a group that worked closely with Latino Victory on the "Families Fight Back" campaign, sits on the advisory board of Soros's Open Society Foundations. The Washington Free Beacon recently obtained unredacted tax documents revealing donors for the Center for Community Change, which does not disclose their contributors. Soros gave millions in funding to the group. It also received funding from the likes of the Ford Foundation, which was first created by members of the Ford Motor Company, but is no longer connected to the company. Latino Victory's senior management previously worked with Soros and the Ford Foundation. Cristóbal J. Alex, Latino Victory's president, spent five years between Soros's Open Society Foundation and the Ford Foundation, his bio states. During his time with the groups, Alex led "$60M in investments designed to increase political participation in communities that have been historically excluded from our democracy." Sara J. Le Brusq, the group's vice president, worked in Soros's office before later joining the investments department at the Ford Foundation. Three others who work at Latino Victory came from the failed presidential campaign of Hillary Clinton. Latino Victory did not return a request for comment by press time. This entry was posted in Issues and tagged Ed Gillespie, George Soros, Illegal Immigration, Immigration. Bookmark the permalink.